Gaps in your smile are no laughing matter, as they can lead to the drifting of surrounding teeth. Dental bridges are one of the ways to eliminate gaps by literally bridging the space between missing teeth. Most dental bridges are made of a false tooth that is held together by two crowns. The bridge is then attached to the teeth on each side of the gap. The finished result is a natural, beautiful smile. Dental bridges are both comfortable and durable. Since a dental bridge requires crowns on the two adjacent teeth, there are three teeth involved compared to only one with an implant. The dental implant is completely separate. So if the surrounding teeth are otherwise healthy, a dental implant may be the better solution. A dental implant prevents the bone resorption that occurs when you are missing a tooth. If a dental bridge is used, the bone where your natural tooth once was will shrink. If you are in a situation where the two surrounding teeth require crowns anyway, then a dental bridge may be the best alternative. Dental implants look, function, and feel just like your natural tooth. Every circumstance is different. 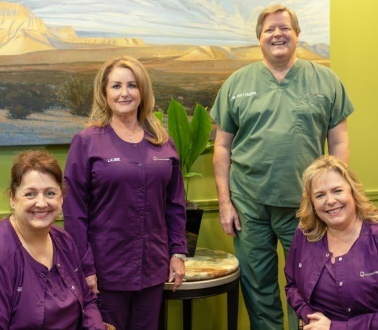 Dr. Coleman will meet with you to help you understand and determine which solution is best for you. You can visit our dental implants page for more information about this treatment option.